Join Rhythmic by Nature’s Drumming Ensemble for an interactive, energizing, fun, community building and memorable music-making experience. Learn basic hand drumming technique, simple and fun ways of creating rhythm as a group and in no time, we will all be groovin’ together. No previous drumming experience is necessary and all instruments are provided by Rhythmic by Nature. Terri Segal is an Expressive Arts Therapist, Facilitator, and Educator who is dedicated to sharing the therapeutic value of creative expression through Group Drumming and Expressive Arts workshops. 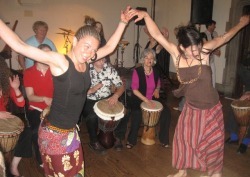 For the past 10 years, Terri has studied and taught West African Drumming and World Percussion. She is a trained Expressive Arts Therapist and Drum Circle Facilitator. Through her business, Rhythmic by Nature, Terri facilitates Group Drumming Programs at schools, social service agencies and for small and large businesses for the purpose of team building, wellness, recreation and education. *"Green" Goody Bag BYOB - Bring your own bag! *Limited Tickets $25 online, $30 at the door, $15 after 10pm, event ends at midnight. Prosad has spent the last three years inspiring audiences onto the dance floor with his mystical "Trance Sitar" grooves. After studying Classical Sitar both in Toronto and while traveling through India, Prosad had a vision to fuse Classical Indian Sitar Ragas with edgy electronic beats, live percussion, didgeridoo, flute and vocals to create a unique style called " Trance Sitar". It is both meditative and energizing at the same time. Listeners and dancers alike can feel the "calm centre" created by the meditative sitar, while moving at a whirlwind pace to the dance beats created by the band. The inner and outer meet and harmonize in this unique musical experience.